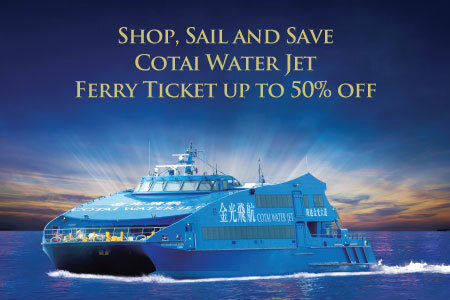 Shoppers who spend MOP250 or above in a single transaction in any shops at Sands Shoppes (“Shoppers”) and present a machine-printed receipt (“Receipt”) can enjoy discounted Cotai Water Jet full fare adult ticket on the same day as the date of the Receipt (“Campaign”). After the Receipt used, it will be stamped with the words “Enjoyed ferry ticket discount”. Each Receipt can enjoy a maximum of two one-way tickets for the same sailing or two sets of round-trip tickets on same sailing. This Campaign cannot be used in conjunction with other offers and discounts. The authorized ticketing counters for this Campaign are set out below. All sailings must be finished on or before 31 December 2019. This Campaign is subject to seat availability. Cotai Ferry Company Limited (hereinafter, the “Company”) will not be responsible for any lost or stolen ticket and no reissuance of ferry ticket will be entertained. The Company reserves the right to revise, cancel, suspend or modify this Campaign at its sole discretion without notice. In case of dispute arising out of or in connection with this Campaign, the decision of the Company shall be final. The English version shall prevail when there is a discrepancy between the English and Chinese versions of these Terms and Conditions.